The Petsafe Deluxe Big Dog Spray Bark Control Collar will sense vibrations of your dog’s vocal chords to distinguish each bark from other external noises. When it recognises a bark, the collar will emit a safe, but annoying burst of spray that your dog will begin to associate with barking. This should quickly stop the unwanted behaviour. 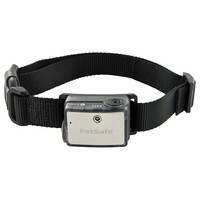 The Petsafe Big Dog Deluxe Spray Bark Control Collar is proven effective in deterring barking when worn.